We had previously been referring to our Windows Azure libraries via the SDK and I noticed that they have NuGet packages for them now. This is obviously way better, so I'm swapping out all of those references for the NuGet packages. However, I can't find a NuGet package for Microsoft.WindowsAzure.ServiceRuntime.dll that contains classes such as RoleEnvironment, etc. Are we supposed to be referencing this dll from the SDK installation and not a nuget package? That seems extremely odd. Am I just not seeing the package for this assembly? I've now installed all of the "windowsazureofficial" tagged packages (just temporarily) and none of them seem to have the correct reference! The latest Windows Azure SDK is 1.7 so If you need updated Microsoft.WindowsAzure.ServiceRuntime you would have to manually install the SDK in your machine and add those references to your role. For anyone still battling, make sure you look under Assemblies > Extensions ;) This has now got me twice within 3 months! In this case you should download and create a "static" link. 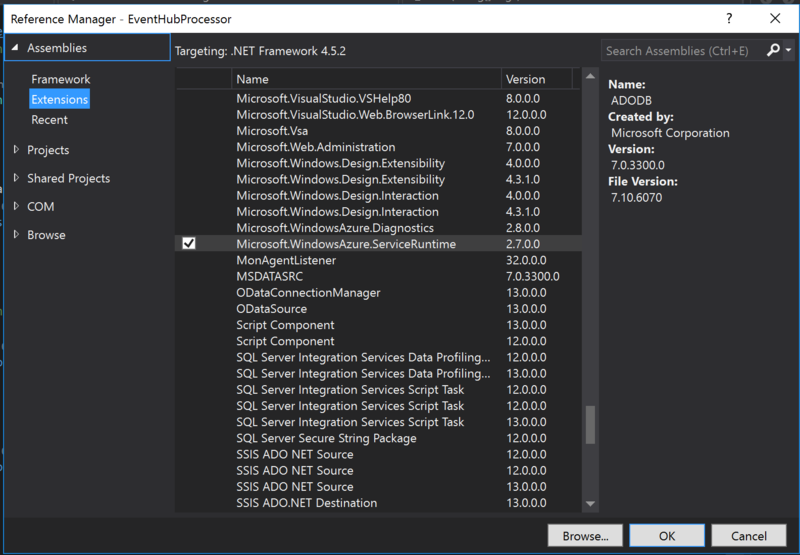 You need to install the particular version of the Azure SDK which you want to build with. Actually you only need to install certain parts of it including the reference libraries(there are multiple parts of the SDK you can download separately) - and it depends which assemblies you are looking for. e.g. for 2.2 or 2.3 SDK and Microsoft.WindowsAzure.ServiceRuntime or Microsoft.WindowsAzure.Diagnostics assemblies, you need the 'WindowsAzureAuthoringTools' MSI installer - not the 'WindowsAzureLibsForNet-x64' MSI, which installs some of the other reference libraries. Its likely that they don't want to distribute the core parts of the SDK so you still have a requirement to install the actual SDK. I messaged (via nuget) the owners of the "windowsazureofficial" nuget packages and asked for feedback and I'll update this if I hear back. As for upgrading, first get the sdk and then follow the upgrade instructions here. The references will automatically be updated and it will convert local references to nuget package references as well, when it can. Not the answer you're looking for? Browse other questions tagged c# azure nuget azure-sdk-.net azure-service-runtime or ask your own question. How to sign unsigned assembly in a nuget package?